As I sit here writing this, there is currently a light (yes, light, knock-on-wood) dusting of snow outside. And I drove around earlier this afternoon on a quest for wiper fluid (my windshield more or less appeared to have a fine spray of opaque salt--not exactly the safest for highway traffic). And even though we have on sweaters and thick socks: winter hasn't been that bad, yet. If I've jinxed it for all of us, well. Be mad if you want to, but it won't be the first time. I think I can shrug off winter at this point because in just a few days (namely, five), I am jetting off to Florida for my little sister's wedding. And then, just five days following my return, will be on another plane to Oaxaca, Mexico. More on this later, but it's safe to say I'm choosing the escapist route this time around. Still, winter or no winter, the fact that I wore a T-shirt last Sunday or not, I've still had a sincerely deep craving for a warm bowl of chili, the ultimate cold-weather comfort food -- okay, maybe not ultimate. Mac & cheese, hello. But certainly in the top ten. And as far as comfort foods that are vegetarian-friendly, chili pretty much let's you play by your own rules. 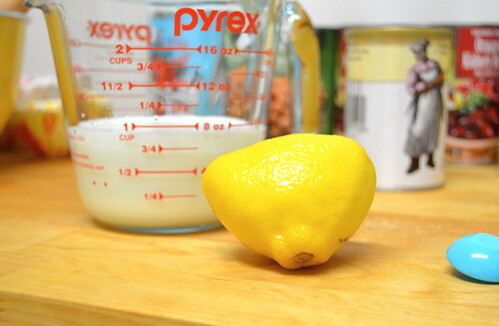 A little of this or that never hurt, so mixing up a recipe without really having a recipe is usually the way to go. 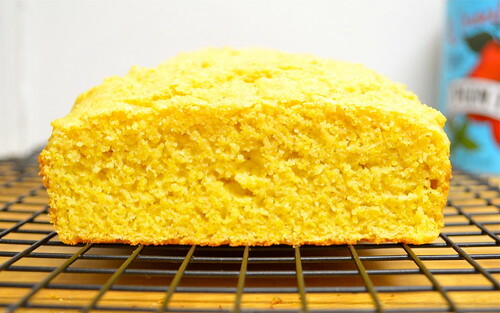 I've also lately been obsessing over finding a good cornbread recipe. Since there are about, oh, I don't know, a MILLION, I have no idea what good actually means. I only know what it tastes like. Crumbly, slightly sweet, sturdy enough for a healthy (ahem) smear of butter. You know, that. Preheat your oven to 400 degrees. 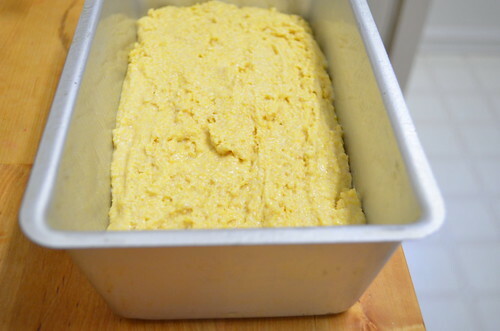 Take some nonstick spray or butter and go to town on a 9x5-inch loaf pan. 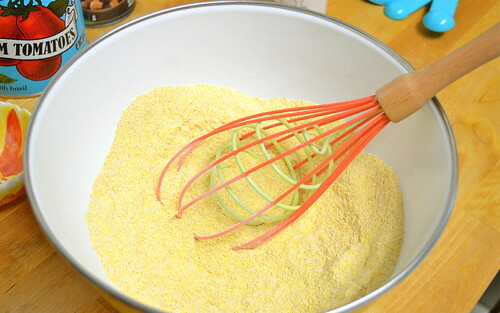 In a large bowl, whisk together your flour, cornmeal, sugar, baking powder and salt. Meanwhile, in a small bowl, lightly beat the egg. Then whisk in the sour cream, buttermilk and olive oil. Then gradually stir your wet ingredients into the dry ones, then spread your batter into the prepared pan. Bake for about 22 to 25 minutes. You should see a beautiful golden brown (literally!) color. 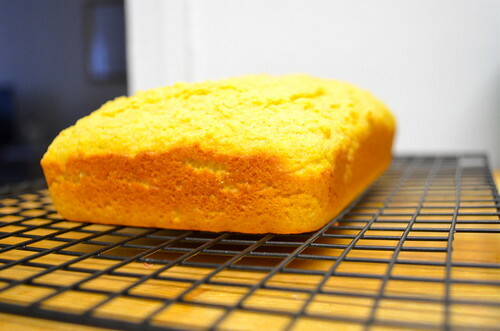 And everyone knows a cornbread with a slightly darker edge is perfect for a nice crusty crunch. 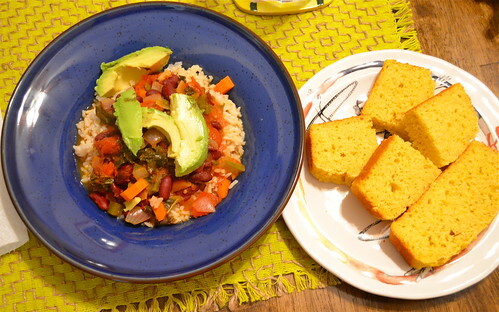 While your cornbread is in the oven, time to get started on your chili. I'll go ahead and tell you what I put in mine, but feel free to ad lib here. 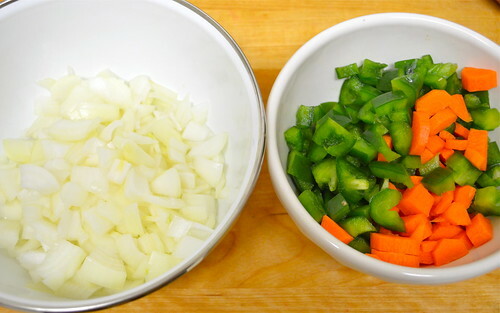 Chopping up almost any vegetable will work, spices, you name it. 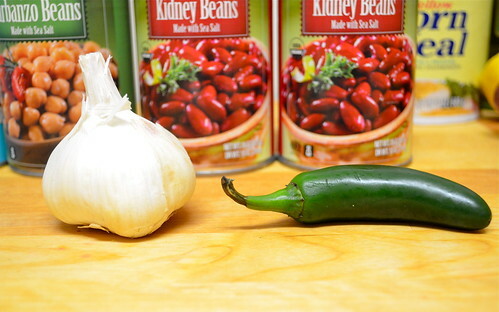 If it's a chili (or a soup), it's worth a shot. Start by heating the olive oil in a large stockpot. Add your garlic and onions and let them caramelize, about two to three minutes. Slowly add your bell pepper and carrots (if you decide to include any other sturdier vegetables, now would be the time to toss them in), stirring for about five minutes. Add in your jalapeño, red pepper flakes and other spices. Adding your spices in early will help them permeate the entire dish, making the flavor more well-rounded throughout. And so on and so forth. 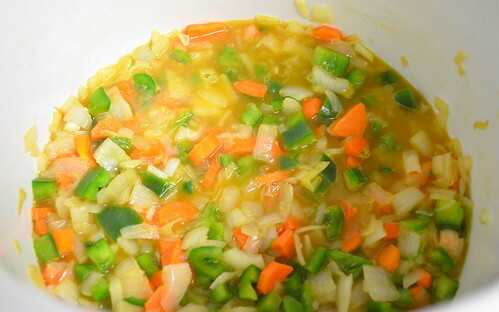 Add your broth, using a wooden spoon to scrape up any goodness that may be gathering on the bottom of your pot. Next, toss in your kale, which will immediately begin its shrinking act. 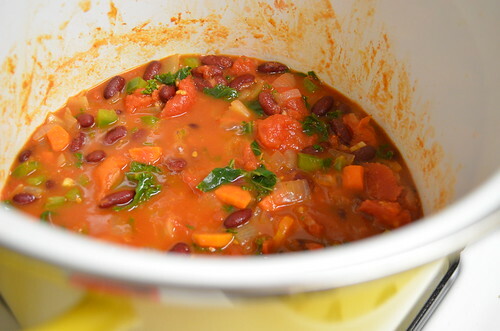 Let this mixture come to a simmer before adding your tomatoes. If you already went ahead and got diced, like you should have, great. 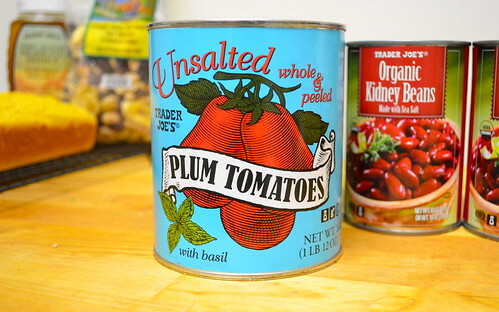 If not, like me, go ahead and add your canned tomatoes, juice and all, and use a fork, slotted spoon, potato masher, whatever you've got, to crush them into smaller more chili-sized pieces. Then add your beans. If you thought have a free-for-all ingredients list was great, I've got more good news: however long you let this cook is up to you. The thing about chili is that it only gets better then longer it simmers. If you have an hour or two, great, let it go. If you've got to have dinner on the table in 20 minutes, this will still work. It all depends on your sense of urgency and, well, hunger. Us, we let it go for about an hour and a half, just long enough for the stomach-rumbling to get really unbearable and after we snuck a corner (or two) of the already cooling cornbread. Psst. 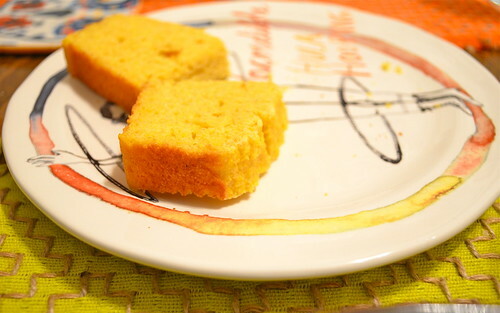 Let me prepare you for something here: this cornbread is not sweet. At all. If you're thinking of the densely sugared versions that your mom used to make, possibly in a cast-iron skillet, that is not what you're getting with Deb Perelman's Marcus Samuelsson's adapted version. Add a little bit of butter, a drizzle of honey, and it works. And sweeter versions to come.